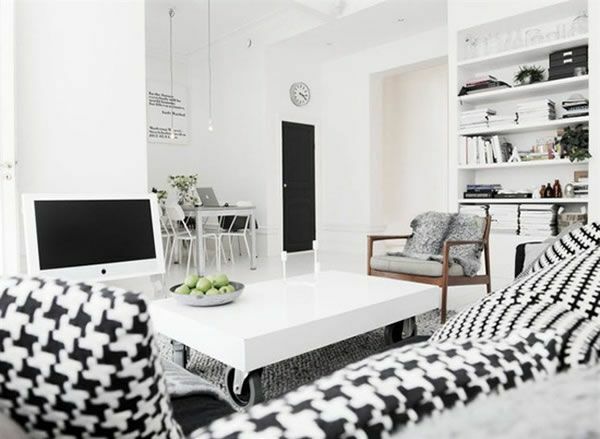 For today we would like to showcase this unique duplex apartment that impresses due to a simple, but charming white color scheme. Stylishly decorated with pale walls, white painted wooden floors and rustic brick walls, this apartment has a total living surface of 94 square meters and consists of 3 rooms plus kitchen, according to Alvhem. Seven generous windows to the south allow the sun’s rays to find their way into the two-level crib. The ground floor consists of a spacious hall, a small bedroom and a tiled bathroom with Jacuzzi and shower. Connected to the hall, there is a bright and airy living room that is currently used as a combined TV room and study. The walls are painted white to enhance the room’s open feel. Two large windows, with niches deep enough to sit in, invite light in the room. The ceiling height is approximately 2.30 meters. A spiral staircase of black wrought iron leads up to the next floor. When you pass the stairs to the upper level you can reach this apartment’s most interesting spaces. A living area , a dining room and a large bedroom complete the design of this welcoming duplex.